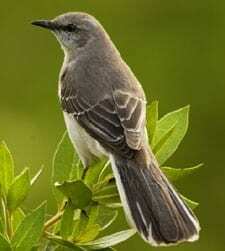 If you’ve been hearing an endless string of 10 or 15 different birds singing outside your house, you might have a Northern Mockingbird in your yard. These slender-bodied gray birds apparently pour all their color into their personalities. They sing almost endlessly, even sometimes at night, and they flagrantly harass birds that intrude on their territories, flying slowly around them or prancing toward them, legs extended, flaunting their bright white wing patches.